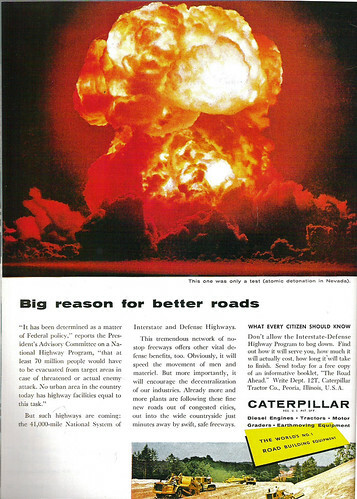 So reads the first paragraph of this 1958 ad, which capitalizes upon Atom Age anxieties to pitch the virtues of the coming system of interstate highways…and the fine Caterpillar products used to construct them. The goal was to decentralize and scatter vital industries away from the existing compact (and target-rich) urban cores while maintaining transportation efficiency should a nuclear war actually occur. The I-495 loop, for instance, not only links greater Worcester to Boston’s I-95/93 corridor, but acts as a fallback route to maintain the integrity of the grid should the Expressway be reduced to so much glowing rubble. The promise of easy evacuation from threatened areas was the icing on the cake, and something for present-day folks to ponder as they sit in bumper-to-bumper traffic caused by some lookyloos gawking at a disabled vehicle in the breakdown lane ten miles up the road. I have a fairly large collection of nuclear war related music, with selections ranging from pop to jazz to funk to punk and all genre points in between. This piece of Welsh postpunk is the most effective bit of the lot, as it boils the fear, sadness, and resignation down into a hauntingly heartbreaking epitaph for a suicidal world. This is how the world ends. Not with a bang, but with an almost imperceptable sigh. This I did not know. Boy, ya learn something everyday on the ‘Net. That being said, I would bet dollars to doughnuts that if an attack was ever imminent, the Feds wouldn’t say anything about it. No way out of most metropolitan cities on a sunny weekend day, much less during “armagideon”. Is “lookyloos” the American variant of “rubbernecker”? Or does the UK not enjoy sole rights to the latter term? “Rubbernecker” is the common term here, too, but a went the obscure/archaic route.